As we mobilize and prepare for an extended shutdown, we want to share a list of resources that could help you or someone you know who is being affected by the shutdown. 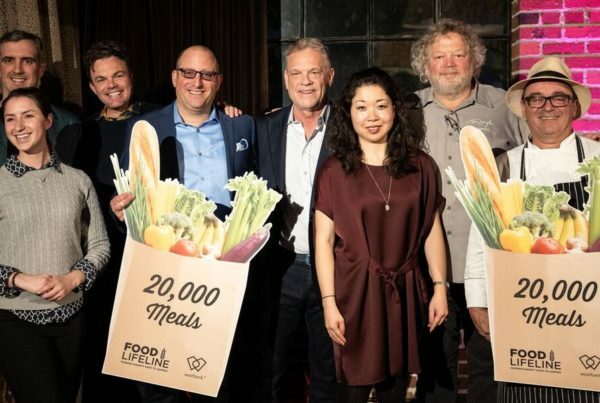 Everyone is eligible for food bank assistance. If you are going without income during the shutdown and are in need of food, we encourage you to visit our food bank map to find a location in your neighborhood. If you are in need of additional public assistance you can explore options and sign up for resources at parenthelp123.org. 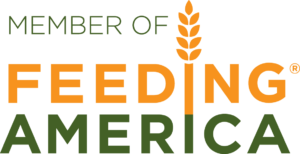 Click here for general information regarding federal nutrition programs. Eloise’s Cooking Pot Food Bank in Tacoma is holding special distributions for federal employees Wednesdays from 1p.m. to 4p.m. Click here for more information. The Making A Difference Foundation is offering mini grants of up to $250 in cash gift cards to federal workers who demonstrate immediate need for bill assistance. Click here for more details. 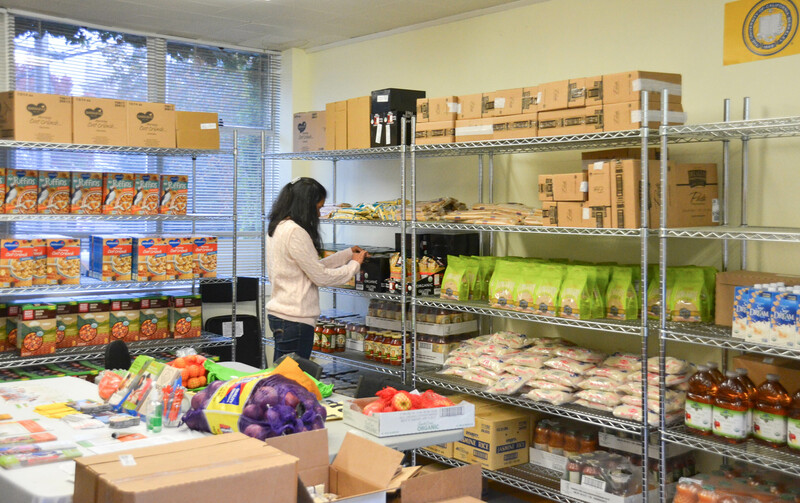 Ferndale Food Bank is opening for special distributions for federal employees. Some credit unions, like Washington Federal, are providing no interest loans to federal workers. Port Angeles Food Bank is holding special distributions for affected workers. Check their Facebook page for updates and times. Seattle Area Chief Petty Officers Association opened a Food Pantry in the CPO Mess 3rd deck of Building 7. The pantry is open Monday – Friday from 11 a.m. until 2 p.m. to all “AD CG, Reserve on AD, CG Civilians effected by the shutdown.” Click here for more details. Auburn Food Bank is opening special distribution for furloughed employees. Click here for more details. 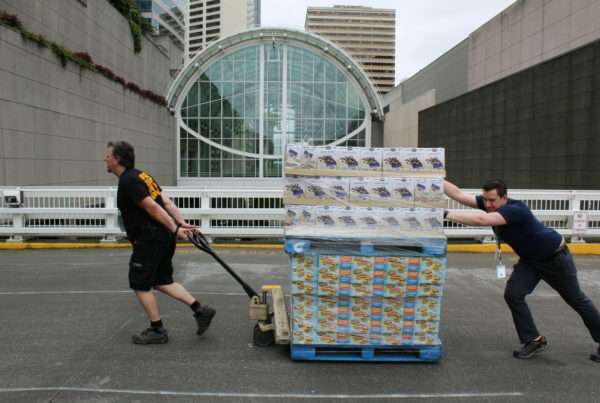 Seattle Humane Society is hosting special distributions of pet food. More details here. The Des Moines Food Bank is providing services to TSA agents and all government employees who need support at this time. Blaine Food Bank is hosting a special distribution for federal workers near the US/Canada border on Jan. 26. Read article. Ocean Shores Food Bank posted on their Facebook page that federal workers are welcome at the food bank. 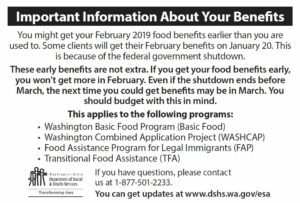 According to DSHS, February SNAP benefits were distributed early on Jan. 20 due to the shutdown. If you received benefits early, additional February SNAP benefits will not be distributed. See below for more details. TEFAP and CSFP commodities should continue with uninterrupted service through the end of February. Social Security payments will continue without interruption.